The good news is that John Boehner, Speaker of the House of Representatives and my congressional representative, has a Democratic opponent this year: A fellow by the name of Matthew Guyette. This is good news in that last election cycle Boehner ran unopposed, and generally speaking democracies are healthier when their elections are contested. Whether one intends to vote for Guyette or not, having a choice for one’s vote is a good thing. 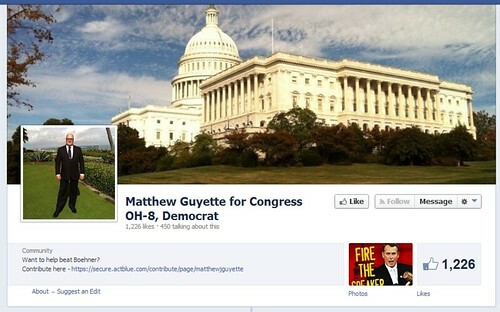 The bad news is that at this point, it appears that the way Matthew Guyette is planning to run for the position of the Ohio District 8 Representative to the United States Congress is to put up a Facebook page and fill it with a bunch of snarky memes dedicated to the proposition that Republicans generally and Boehner in particular are, like, bad, and you should totally hate them. In other words, a page largely indistinguishable from umpteen million other snarky liberal and/or Democratic pages on Facebook. What I can’t find on Guyette’s Facebook page: Any real information on who he is or any useful, detailed articulation of what his political positions are and how he plans to implement them if he gets to DC, or why he, in particular, deserves my vote over Boehner this November. The best I get is a sentence or two at the top of the various links and memes, most of which do not offer any substantive food for thought. Beyond that: Nothing useful. So I thought, well, maybe all that is on Guyette’s Web site. I scrolled back to the top of the page, looking for the official “Guyette for Congress” Web site link. And didn’t find it. Fine, okay, I went looking for it on Google — which is already, incidentally, more than most people in this same situation would do — and came up with nothing. What I get is the Facebook page. I will note that at the top of the Facebook page there’s a link to an ActBlue page to collect contributions, but that ActBlue page is almost devoid of any information about Guyette beyond the “I am running against Boehner! Send me money!” sort. ActBlue has a $30K goal for Guyette; as of me writing this, he’s at $484. And no, I didn’t donate. Why? Because, for starters, I know nothing about this dude, nor is he making it easy for me to learn anything. Facebook pages filled with memes, snark and links are not a substitute for a serious campaign Web site with serious and useful information for voters. Look, I’m deeply unlikely to vote for Boehner, this year or any other. But I’m not going to vote for Guyette — or anyone, for that matter — just because he’s running on the “I’m not Boehner” platform. You know what? I’m not Boehner, either. Not being Boehner is not that special. You have to give me something more. I’m perfectly happy not to vote for a Democratic contender for OH-8 if I don’t think he or she is worth my vote. Maybe Guyette is, but I don’t know. He’s not telling me. Boehner, incidentally? Very nicely put together campaign Web site, with all sorts of details on his positions, what he’s doing, who he is and his engagement with his district. His facebook page? About his accomplishments and positions, not so much with the snark and memes. And, it has a link to his campaign site right where I can find it. If I was voting strictly on coherent social media messaging, this race would already be over, and Boehner would get the vote. Mind you, this is part and parcel with how the Democratic party does things around here in OH-8. Boehner is basically unassailable in the seat until or unless he decides to retire and so the Democrats don’t appear to want to make that much of an effort. On one hand, this is understandable — why throw money and effort into a race you’re simply never going to win? — but on the other hand, come on, guys, throw me a bone, here. At least make me feel like if Boehner got hit by a truck and the Democrat was then the only living candidate in the race, that I could feel like whoever was running would do a better job in the role than Boehner’s flattened corpse. There’s more to being a Representative than being against one’s opponent. In Guyette’s case, I have no idea what more he brings to it. So: Convince me, Mr. Guyette. Because otherwise, while Boehner won’t get my vote, you won’t get it either. You can start with a site — a real one, away from Facebook — that actually tells me what you are for, not merely who you are against. Update 5:45pm: Commenter John Mark Ockerbloom notes another Democratic contender in OH-8, Tom Poetter. And look! He has a Web site with information about him and his positions! It’s just that easy! And the confession involves this very site. You’ll want to check out this shocking turn of events. The worlds of fantasy offer up ample space for the imagination to play… but do they also and simultaneously constrict those same imaginations? 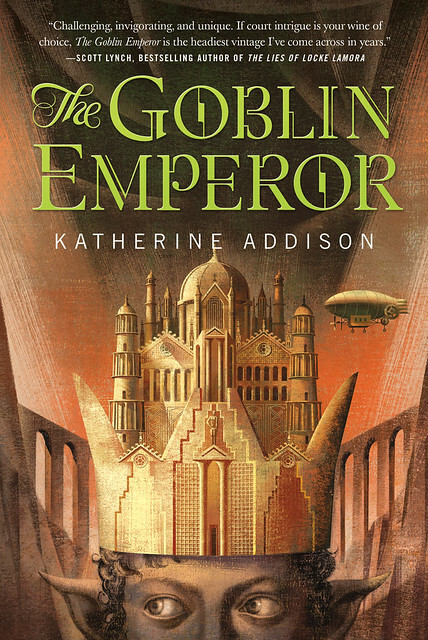 Author Katherine Addison fears they might, and when it came to her novel The Goblin Emperor, Addison decided on a new world with a difference. She’s here to explain how, and why. By the time you finish writing a novel, it’s frequently somewhere between difficult and impossible to remember how you started, but in the case of The Goblin Emperor, I remember exactly: I wanted to write a story with both elves and airships. Because there was no reason I couldn’t, and it seemed like an awesome idea. Once I’d thought of airships, it was inevitable that I would think of the Hindenburg. Although I love and write science fiction and fantasy–and don’t want to stop!–down at the bottom of my heart, in the darkness among the spiders and ghouls, I’m a horror writer. I tend to be interested in how things go wrong, and I’m drawn to catastrophe. Everything else in the book came from that first decision to combine elves and airships and catastrophe and trying to think through the ramifications of each subsequent domino as it tipped to knock the domino behind it. As a part of this process, I found myself thinking a lot about science and technology and the conflicted relationship epic fantasy has with both of them. By “epic fantasy,” I mean what Tolkien called “secondary-world fantasy” (which is a better name, but much more awkward): fantasies that take place entirely in made-up worlds with no reference to the real world at all. Tolkien himself is a prime example, and the genre continues to thrive. To give you some living practitioners, just off the top of my head: Kate Elliott, David Anthony Durham, Martha Wells, Scott Lynch, N. K. Jemisin, Laurie Marks, Ellen Kushner, Saladin Ahmed. I love this genre and have since I was very small, but I do find its attitude towards science and technology frustrating. Somewhere along the line, we got it into our heads that any society with magic would, for some reason, stop advancing somewhere shy of the Industrial Revolution. The implicit (or explicit) assumption often seems to be that magic trumps gunpowder, like some weird game of Rock Paper Scissors. Or there’s been some sort of giant mysterious cataclysm that destroyed all the technology and (apparently) made everybody stupid. And we’ve all been brainwashed by Tolkien into believing that only evil people have (or want) technological advancements past the Spinning Jenny, and that a nostalgic pastoral technology-rejecting Arcadia is obviously better than, oh, I dunno, flush toilets. Or flashlights. Or fire alarms. So we end up, most often, in some stagnated Hollywood version of “The Dark Ages” with castles and people in robes and no interest in science–because magic!–and the most technology you’ll see is maybe a catapult. Diana Wynne Jones’ brilliant Tough Guide to Fantasyland skewers this cobbled-together mess of assumptions and lazy thinking like it was a shish-kebab. The very fact that she could do so tells you just how codified this generic fantasy setting has become and how many writers use it. The thing is, this set of assumptions and valuations becomes a cage. So even if you’re trying to write a society that has both magic and technology, it can be really hard to remember that the cage door isn’t actually closed. I had to keep reminding myself as I was writing The Goblin Emperor that technological progress is not bad, that scientific inquiry is awesome, that I wasn’t violating any genuine taboos by having steamships and factories and astronomers and clockmakers and gas lamps. And the enormous steam-powered drawbridge that the characters spend the whole book arguing about. I don’t deny the appeal of a pastoral world, one without air-pollution or global warming or oil spills, and I think fantasy does provide a much-needed outlet for that craving of the imagination. I don’t want to do away with that. But fantasy can do so much more. There are so many other ways to imagine our relationship with scientific and technological progress than this Manichean either-or we’ve saddled ourselves with. I would love to see fantasy, as a genre, explore that, instead of cowering in the cage we’ve built ourselves, as it gets smaller and smaller every year. Fundamentally, that’s what I want to say. These unwritten rules are a cage, and there is no reason we should not climb right out. And that’s my Big Idea.